The World War II era supernatural thriller Overlord got a new poster and it’s a bloody good one. 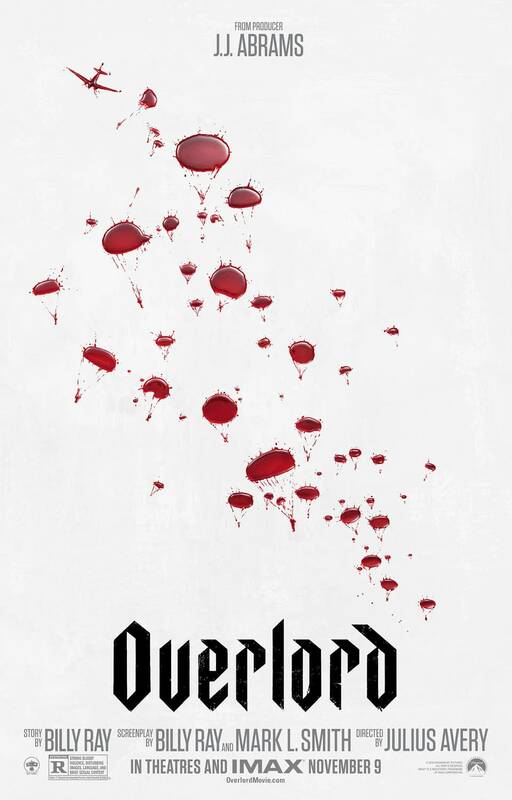 Revealed over the course of several pictures on instagram the poster shows blood splattered as planes and men parachuting to what we can only assume is their doom. According to Syfy if you click the right image you’ll get taken to a short new promo that doesn’t show much in the way of new footage but does show off this interesting movie nevertheless. If you missed out on the first trailer for this one check it out below. This was rumored to be a Cloverfield movie but producer J.J. Abrams has debunked that. Overlord, directed by Julius Avery, stars Jovan Adepo, Wyatt Russell, Pilou Asbæk, John Magaro, and Mathilde Ollivier. It will be released on November 9th.